Designed with the patient in mind, ClearCut ORTHO® eBooks summarize only the highest quality research in an easy to understand, “ClearCut,” way. Our team sifts through thousands of publications, journals, and articles, and presents them in simply defined summaries. The books include a brief education on anatomy and physiology of each condition, the amount of people that have the condition with no pain or dysfunction, best advice on selection/timing of treatment options, questions to ask your healthcare provider that will help guide the conversation and diagnosis, and much more. All together, these are the tools that could help save you from surgery! Too many providers you are just another statistic. Check out these unbelievable stats by clicking here! You may be on this site prior to ever seeing a healthcare provider. Or you may be visiting to get information because you are scheduled for surgery and not sure if it is the best option. Either way, there are a few things to consider before starting these eBooks. Take your time reading. Focus your attention on the ClearCut Summaries written by our team…they’ve done the hard work for you. Remember, each section is a collaboration of multiple disciplines and all available research. 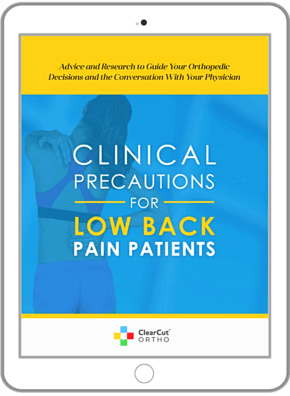 Remember, use this site and these eBooks as a conversation starter with your providers to help find the best management of your orthopedic condition. If the management and treatment your provider is offering do not line up at all with the best evidence and advice from our team, it may be beneficial to seek out a second opinion.